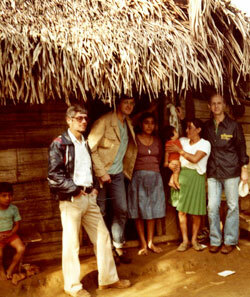 In January 1981, Dr. Ed Miller, now an MU professor emeritus, led a medical delegation to Guatemala in the first Manchester University Medical Practicum January Session course. The MU chemistry professor’s team included eight students and medical professionals Donald Parker ’56, M.D., and Richard Myers ’69, D.D.S. The team was based in Mariscos, Guatemala, at an Episcopal parish with a small clinic. The group of 13, which included the local priest and a boatman, traveled in one motorized dugout canoe to serve villages along the shore of Lake Izabal in eastern Guatemala. In that first trip the total budget came to $8,800; students were charged $720; roundtrip airfare from Fort Wayne to Guatemala City was $379; and the cost of medical, dental and other supplies came to $850. During 10 days of clinics they completed 557 medical and 188 dental consultations. Almost all medical supplies were provided by Interchurch Medical Assistance in New Windsor, Md. 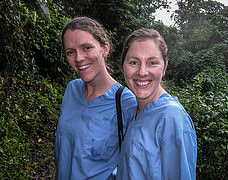 In following years, the course provided care in Panama, Honduras, Dominican Republic and Costa Rica. For more than 20 years, it has taken students to live and eat with, learn from and serve villagers in remote areas of Nicaragua. Leadership of the course has been assumed by Dr. Jeff Osborne, associate professor of chemistry at the University. The number of students and professionals involved has grown over the years, along with the scope of medical care, preventive medicine and research. 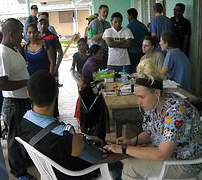 This year’s trip, the 31st, was to the Alto Wangki-Bocay region of northern Nicaragua, near the Honduran border, and involved 16 students and 19 staff from the U.S., including six physicians, one dentist, two pharmacists, two nurses, one veterinarian and a laboratory testing coordinator. All medical work was done in coordination with the nationwide system of small clinics, Sistema Local de Atención Integral en Salud, which is part of the Nicaraguan Ministry of Health. Nicaraguans who joined the group included two physicians, one community health worker, nine translators, four assistants and 12 boatmen. The total trip budget has grown to about $83,000, with $15,824 used for medicines and medical supplies to supplement the many medical and dental donations. 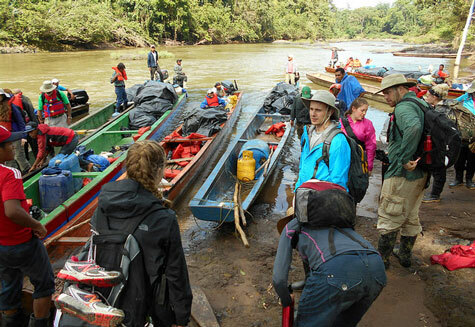 This group of 63 people traveled roughly 160 miles in six motorized dugout canoes to reach three mostly indigenous villages of the Alto Wangki-Bocay. In nine days of clinics the group completed 1,440 medical and 87 dental consultations, performed 924 different lab tests and vaccinated 177 people. Although the focus has traditionally been acute care, the group over the last four trips has successively incorporated the first wide-scale, rapid diagnostic test screenings of local populations for diabetes, H. pylori infection and Chagas disease. It has also been the only group in the region to implement the “see and treat” approach for possible precancerous cervical lesions, which involves visual inspection with acetic acid followed by CO2 tank cryotherapy. Community education was also a focus in the clinic, with presentations given throughout the day to people waiting in line to be seen. This trip was the third to incorporate veterinary medicine, deworming 68 dogs, 232 pigs, 71 cattle, three mules and 16 horses. Since 1981, 336 students, 108 health care providers and 55 other professionals have traveled with the group, performing almost 38,000 medical and dental consultations. Plans for the 2016 course are well underway. Northern Indiana providers who participated this year include Trina Chapman-Smith, M.D., of Auburn, who graduated from MU in 1985; Matthew Sprunger ’78, M.D. , of Fort Wayne; Kathy Long ’71, M.D. , of North Liberty; and Kierstan Hanson, Pharm.D. , of South Bend. Students participating in 2015 were Meaghan Adams of Fort Wayne; Bobbie Beckner of Mooreland; Megan Buckner of Muncie; Eric Cupp of Lafayette; Kristiania Grogg of North Manchester; Kliricia Loc of Kalamazoo, Mich.; Kaitlyn McDermitt of Greenville, Ohio; Anna McGowen of Williamsport; Kyle Miller of Goshen; Erik Nakajima of Oregon, Ill.; Jessica Noll of LaPorte; Loreal Richard of Rochester; Luke Scheel of Lafayette; Taylor Smith of Auburn; Briauna Taylor of Centerville; and Martin Voglewede of Oxford.